Why should you Attend: Employee orientation is the process of introducing employees to their new jobs and work environments. Orientation provides an opportunity for new employees to become acclimated to their new company, department, colleagues and work expectations. 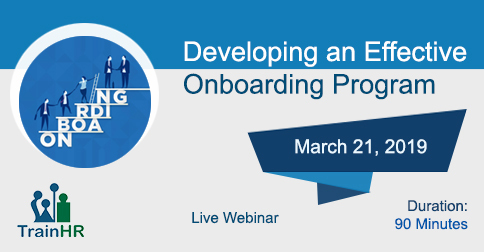 Research has supported the idea that effective onboarding can have a dramatic effect on job performance and satisfaction, organizational commitment, and retention. Recent evidence also suggests that a poor organizational socialization process can result in a new hire's emotional exhaustion and job burnout.